Our mission clearly is geared to more than just riding. We seek to help people, young and young at heart, who understand the emotional bond that can exist between horse and rider, and seek to find it. Punctual arrivals are essential for obvious reasons. 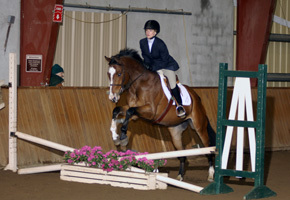 Scheduling the right horse for the right rider requires you to be there at the time reserved. Please respect the rights of the students who are waiting for their mounts to be groomed and cared for. 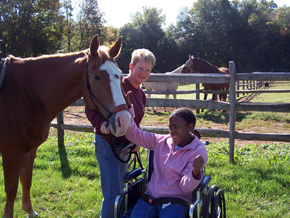 Our goal is to help people of all ages connect with horses. It is our belief that horses can be wonderful healers. Horses can teach us many things in life in addition to physical benefits, there are benefits to our sense of well being. It is our desire to help children or just the young at heart discover the love and warmth this majestic animal gives us so freely. Our mission is unique, we do not seek to be center stage in the show ring, our sights are set on introducing you to the horse, noble and wise, loving and willing to serve our needs and fill our hearts. Open your mind and your heart and watch as the magic unfolds. 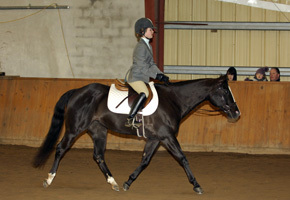 We offer private riding lessons. Ground work can be included, but our main goal is to maximize your time mounted. Riders are expected to arrive 15 minutes before and stay 15 minutes after their lesson. This time will be used to groom your mount before and after your ride.